So it has been some time since I have shared a recipe and today as I was doing some baking to get myself ready for the up coming week I extreme amounts of pumpkin puree left over so I decided to start experimenting and to see if I could come up with something. This is the time of the year of pumpkin EVERYTHING so I figured why not join the bandwagon and see if I could come up with a healthy protein filled snack that would be great for on the go. Seeing how my husband is normally my test subject I figured I would play up a flavour that he loves. So I went with maple. I do what I can to sub out cane sugar, brown sugar, stevia and the like when I can and I try to go for things like pure maple syrup or organic honey they just feel more natural to me and well it worked out for this experiment. So without further ado here’s the recipe…. 2. Mix all dry ingredients together in a large bowl and set aside. In a small bowl combine wet ingredients and be sure to really mash the banana. 3. Pour wet ingredients into bowl of dry ingredients and mix until everything is completely combined. 4. Line a muffin tray with muffin liners and fill them. The muffins don’t rise much they are fairly dense so don’t be worried about over filling them. There is enough batter for 12 muffins. 5. Place in pre-heated oven for 25-30 minutes. Remove allow them to cool and enjoy. 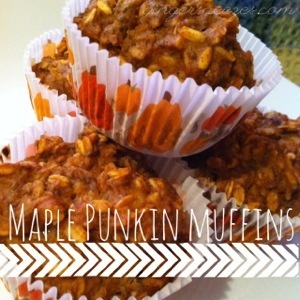 This entry was posted in General and tagged chia seeds, clean eating, fall, healthy-living, maple, Muffin, oats, organic, pumpkin, snack by healingginger. Bookmark the permalink. Sounds good! What kind of protein powder do you like to use? Hey Erin that is a great question there are so many proteins powders out there and so many of they have so much crud in them. I use New Zealand Whey is and amazing product and maxes out at four ingredients all of which I can read and pronounce. I get it from my gym but the local herb and spice home store in Ottawa has started carrying it.